I’m biting my nails here because I have so many things to tell you and if I don’t make a selection, I’ll probably never get to the recipe. First of all the name. Parmigiana literally means “from Parma”. However, this recipe has been known as a tradition in Naples and Sicily since the early XIX century. Food historians have not come up with a conclusive explanation of why an iconic Southern Italian Italian name. Some say that preparing vegetables alla parmigiana – i.e. in the way of Parma – refers to a baked dish made by layers interspersed with cheese. In origin, the eggplant parmigiana must not have not included Parmesan cheese which is now a standard ingredient. The cheese available in the South of Italy was pecorino, provolone, caciocavallo, or mozzarella. It could be that the people from Parma invented the method and the Southern Italians adapted it to local ingredients. I have registered this dish in the list of the mistreated foods of Italy. Too often I see impossibly fat recipes oozing cheap dairy, heavy bread-crumb coating and drowning in industrial amounts of oil. A gastroenterologist nightmare. On the other hand I lost count of absurd adaptations to make it “light”. I admit it, it’s not a low-calories recipe but if one wants dessert one has to have some sugar, right? So what’s the sense to use all sorts of alternatives which will taste and look like something else? 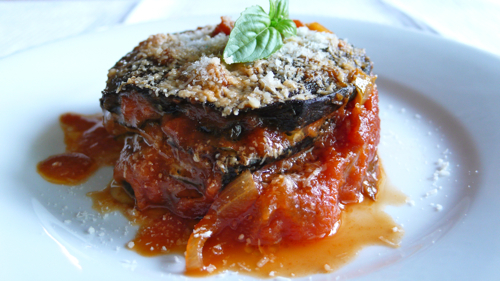 The eggplant parmigiana is a dish of fried eggplants baked with a little cheese and tomato sauce. That’s it, simple, vegetarian and fantastic if properly prepared. Prepare and fry and eggplants as explained here . Place in a colander for a few hours or possibly overnight to get read of excess oil. Grilled eggplants are often too dry, but if you don’t want to fry blanch them before grilling to keep them moist. Here is my recipe. Heat 1 tablespoon EVO oil in a pan, add the onion, cover and saute over low heat until translucent. Stir in the tinned tomato and a sprig of basil, cover again and cook for approx. 10 min. Season lightly with salt and black pepper. Build up the parmigiana: spread two tablespoons of the sauce on the bottom of a ovenproof pan. Cover with a single layer of eggplant slices. Top with mozzarella, 2-3 basil leaves, 1 tablespoons of Parmesan and 2-3 tablespoons of sauce. Continue using all ingredients and finish with a layer of eggplant, sauce and Parmesan. Bake for 30 min until golden and bubbly. You must allow it to cool off for at least 10 min before serving but it’s best at room temperature. In the summer we have it as a main vegetarian meal with crusty bread to mop up the gorgeous juices. Ahhh….. You’ve done it again! I’ve eaten a shed-load of lunch – I’m ready to pop – and now, after reading this gorgeous mouthwatering blog – I’m hungry all over again! It looks so gorgeous. It sounds yummy and healthy, too. Thanks for sharing. Wow that looks so delicious I want to make it but have 2 questions……… what is evo oil? and what are San Marzano tomatoes? Ciao Janey, thanks for visiting my blog! EVO is extra virgin olive oil. San Marzano is a variety of plum tomato which is used in the vast majority of Italian tinned/bottled tomatoes products http://en.wikipedia.org/wiki/San_marzano . I am sure you have seen them a million times at the supermarket. Please let me know how the recipe works out. Please make sure to watch the video. Preparing the eggplants it’s key to this fabulous dish. Wow — another recipe that I would love to learn how to make — properly, that is! Sandra, do I take this as a hint? I grew up in Italy & this is exactly how I remember eating this dish – including served at room temperature! I’m growing San Marzano tomatoes in my garden and am anxious to see how they taste. I’m convinced the soil in Italy makes everything taste better! Grazie Susan, you have a wonderful blog! I am sure that your San Marzano will be delicious, fresh sun ripened tomatoes are the best! Hey Letty! Perfect recipe! I will try it out soon. Just one question – what other cheese can I use apart from mozzarella? Ciao I’d love to know your first name! I would use a different cheese only in an emergency. You need a very mild cows milk cheese that melts easily and is not salty. So no ricotta nor Swiss cheese. The first does not melt and the second has a stronger aftertaste. And I will keep the cheese-advice in mind. This is definitely going to be one of the weekend lunches! Beautiful name, thank you! Let me know how the parmigiana works out. The basil is so fragrant now, it’s the perfect time to make it. Ciao Saretta, parmigiano has a very low lactose content, so if you use just a sprinkle you should have no problems. I also am lactose intolerant and I am able to eat some aged cheeses. Ho scoperto questa ricetta via blog di SandraC, e ora trovo difficile di passare una melanzana nel negozio di alimentari. ah, thank you so much, I love to hear this! What a pretty version of this classic dish! I always make mine the way my grandmother did, dipped in flour and egg before frying. A friend from Naples tells me it is typical of the hinterlands of Campania, while frying the eggplant ‘naked’ is typical of Naples and costal Campania. It makes the dish even richer, but like you say, this dish was not meant to be dietetic! On the other hand, breading the eggplant, so very common here in the States, is an abomination! By the way, when I posted on la parmigiana, I got a rather ‘hot’ comment from a Sicilian, who claimed that mozzarella did not belong in a real parmigiana, which, he said, was from Sicily, not from Naples…. That was the first time I had heard about the Sicilian version. ah Frank you are always so competent, thank you! Indeed eggplant traditionally coated in Naples but I must admit that I have never tried that version as everywhere else eggplant parmigiana is made with “naked” slices. I love the term by the way. My mum was a Sicilian born in 1930. She used mozzarella all her life. Her sisters use mozzarella. So many families, so many recipes – this is Italy – and everyone is convinced to know the only one! Hi Matt, it’s been lovely to have you here and to share my mum’s recipe!